Harry Potter Literary Club…it’s magical! Albert Einstein believed “Imagination is more important than knowledge. For knowledge is limited, whereas imagination embraces the entire world, stimulating progress, giving birth to evolution.” This philosophy of education was a constant for Einstein, who penned it in On Cosmic Religion and Other Opinions and Aphorisms. It is a philosophy of education adopted by UrbanPromise Trenton’s Harry Potter Literary Club, which meets weekly. Trenton-area students from grades 3rd to 6th do not just read the first book of the J.K. Rowling Harry Potter series, Harry Potter and the Sorcerer’s Stone, they experience it as well. In the chapter entitled “Diagon Alley,” Harry Potter receives a wand; his wand. He uses his right hand to hold the wand because it’s the same hand he uses when writing. He flicks his wrist a certain way to get a feel for the wand. Much is learned about Rowling’s protagonist and her wizarding world in this moment, which could easily be forgotten if the reader is not closely reading the text. To emphasize the value in reading a text closely, and to encourage imagination, each student received their own wand, a replica of Harry’s wand, and spent time in club re-reading the text so that they held their wands the same way as Harry – using the hand they write with, flicking their wrists just so. They shared in Harry’s first wanding experience. Later, after reading “The Journey from Platform Nine and Three-Quarters,” students taste-tasted Bertie Bott’s Every Flavour Beans. After each tasting students shared what flavor their bean tasted like; and like Professor Albus Dumbledore, I too had the misfortune of selecting a mustard colored bean, which turned out to be ear wax. 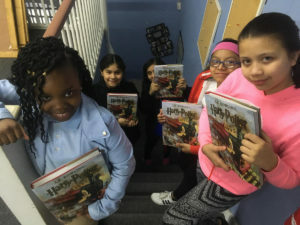 UPT’s Harry Potter Literary Club is the equivalent of a Vitamin B shot; though, instead of energy surging through the immune system, it is imagination – an emphasis on it and an encouragement to use it. Imagination, specifically for children, is often associated with play, and not all children are afforded the luxury of play. It often falls by the wayside, or is disregarded, when we are not living, but surviving. Both Einstein and J.K. Rowling encourage play, as well as the use of imagination. The Harry Potter Literary Club uses the fantastical adventures and adolescent journey of Harry Potter to encourage play and to stretch and strengthen imagination. We are excited to see these kids get excited by reading! Recently, Michael started a Literary Club at Camp Truth where three students are reading a Wrinkle in Time, and the results are every bit as magical. Imagination fueled by knowledge is a powerful combination; and as Mr. Einstein said, the world awaits!